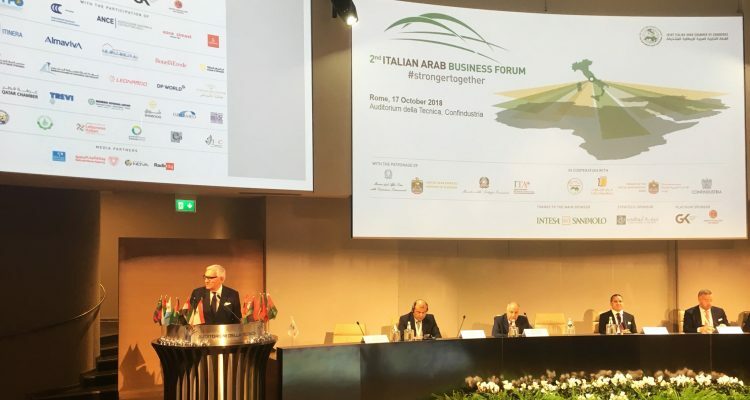 The Second Italian Arab Business Forum, organized under the patronage of the Italian Ministry of Foreign Affairs and Ministry of Economic Development, the Ministry of Economy of the United Arab Emirates and the Italian Trade Agency (ITA-ICE), with more than 600 participants, was a great success. The Forum, organized in cooperation with the Union of Arab Chambers, the Federation of UAE Chambers of Commerce, the UAE Embassy in Rome and Confindustria (the main Italian industrial association), was a unique event of its kind in the Italian economic landscape and a perfect networking opportunity for all the participants. As JIACC, we would like to thank all the Arab Embassies in Rome as well as the Italian Embassy in the UAE for their support. A special thank goes to each of our 600 participants for their enthusiastic commitment, the national and international Institutions for their exceptional contribution and all of our Sponsors, especially Intesa Sanpaolo, GK Investment Holding and Abu Dhabi Chamber of Commerce, without which we could not rely on such a great result. A particular thank also to all of our Partners. Among them the Sharjah Investment Authority, Emirates, Shurooq, Almaviva, Itinera and the Qatar Chamber of Commerce for their dedicated support. Furthermore, a great thank to all our speakers for having introduced interesting and contemporary economic issues in this crucial moment for Italian Arab economic relations. To see the presentations discussed during the Forum, click here. See you in the Third Italian Arab Business Forum, October 2019, Milan!